This was a tough review to write. HOUSE OF HADES is a fantastic, five-star, non-stop adventure full of characters I adore and couldn't wait to talk about. The problem is HOUSE OF HADES is the fourth book in a five book series. So I'll start by saying this; if you haven't read the first three books in The Heroes of Olympus series, you should start now. Right now. Today. Because each and every one of them (especially HOUSE OF HADES) are amazing. Greek mythology and first loves and monsters and a race to save the world with Percy Jackson kind of amazing. 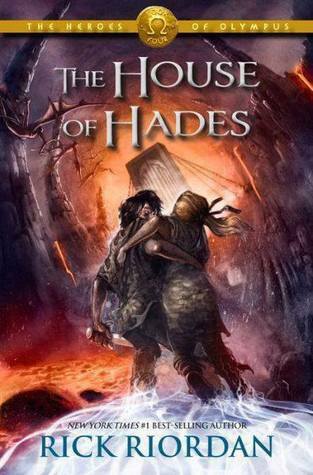 HOUSE OF HADES picks up where MARK OF ATHENA left off with Percy, Annabeth, Jason, Piper, Frank, Hazel, Leo and a few other interesting companions on a journey to the House of Hades in an effort keep Gaea from rising. (Note: don’t book your next vacation to the House of Hades or Tartarus) One of the things I love most about this series is how we hear from all seven main characters. While most books are told from one point of view, Rick Riordan gives us seven. Yes, seven! Each voice is so distinct and true to character that even if the chapters weren’t labeled with the characters’ names, you’d be able to identify who was narrating. That alone is enough to make me recommend HOUSE OF HADES and The Heroes of Olympus series, but I can’t stop there. This is a story of friendship, trust, determination and sacrifice that had me laughing and cheering one minute then crying and screaming the next. The pacing is so spot on that I didn’t skim a single sentence. (Note: this is true of all of Riordan’s books) An amazing feat for a 597 page book. If that isn’t enough to convince you to read HOUSE OF HADES then I’ll end with this…there’s a flying ship controlled by a bronze dragon head, cow beasts that wander the streets of Venice and can knock a person dead with their poisonous breath, a giant janitor named Bob, and a farting pole cat. For more information and fun visit The Heroes of Olympus page and check out this video of author Rick Riordan reading an excerpt from HOUSE OF HADES. The book is really good and is also delivered by flipkart in excellent condition. The book is also available at a cheap price compared to what is sold in stores these days. the book is also unlike the first two books in this series in which Rick Riordan tells the story of the greek and the roman camps separately. In this book, despite the fact that percy and annabeth are separated from the others, the story of both the parties here is told in great detail. A wonderful book, well written and a must-read. Rick Riordan sure does know how to mix modern with mythology into fiction!